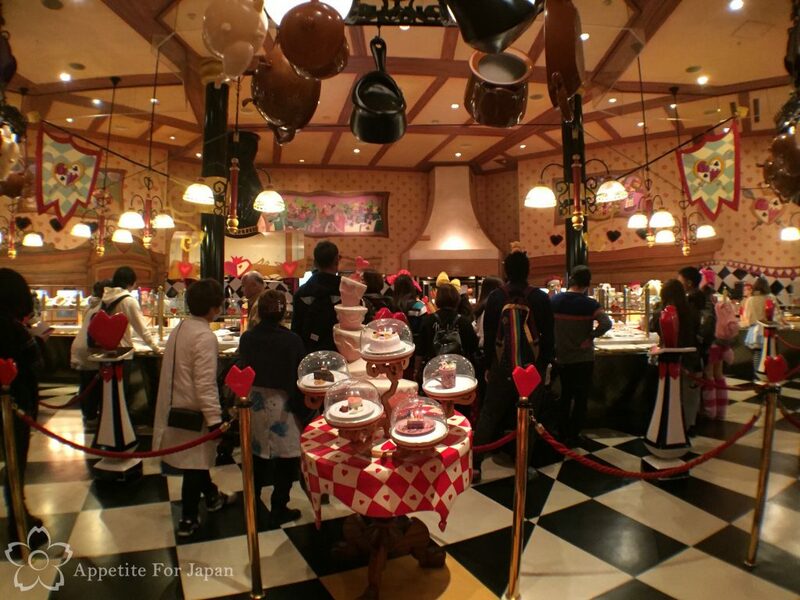 Queen of Hearts Banquet Hall is an Alice in Wonderland themed restaurant at Tokyo Disneyland. 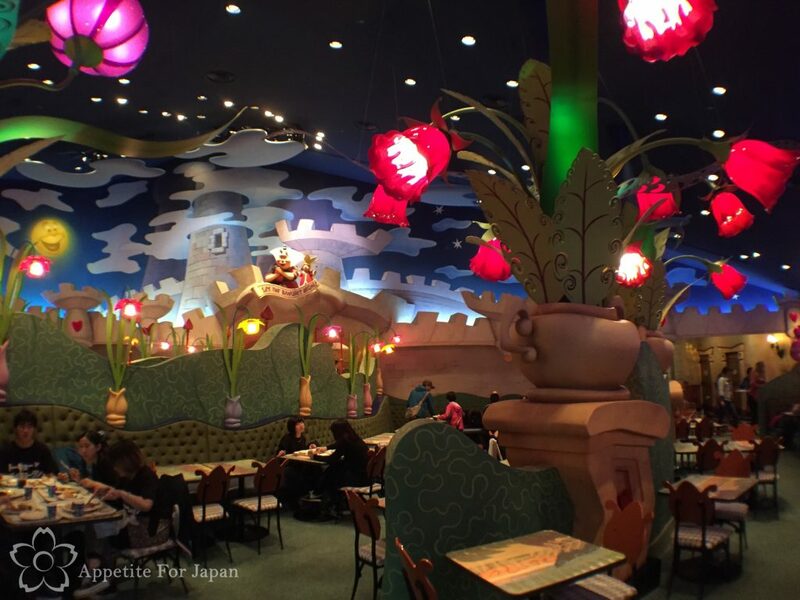 If you’re planning a trip to Tokyo Disneyland and you’re into Alice in Wonderland and/or themed restaurants, read on! 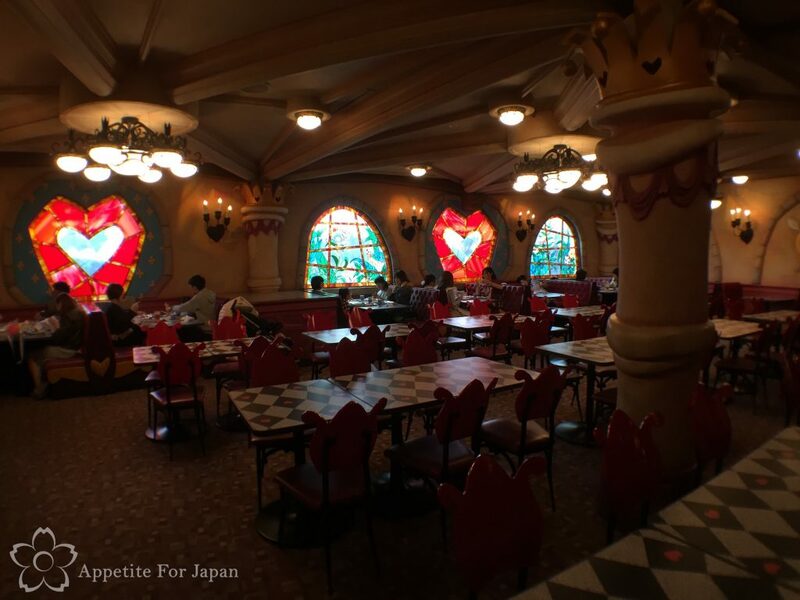 Queen of Hearts Banquet Hall is one of the counter service restuarants at Tokyo Disneyland, and we’d been keen to check it out for a while. Previous attempts were thwarted by the very, very long queues and our disinterest in spending our day lining up for lunch. This time, we got in early! The plan was to get there around opening time, which we thought was 10:30am. I think the hours may vary, as that day it was already open. The somewhat early start meant that we were able to walk straight in! 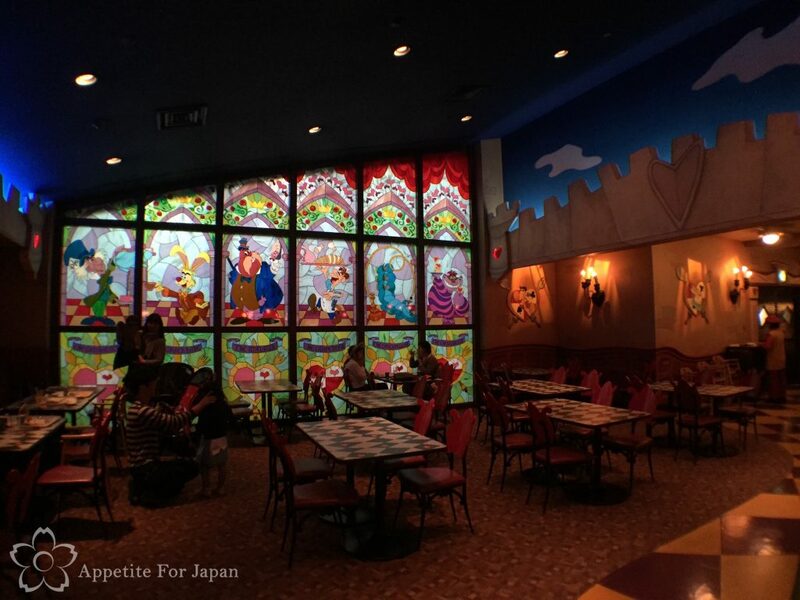 As soon as we entered, it was clear to us why this restaurant is so popular: it has some of the best decor you’ll find at Tokyo Disney Resort (and that’s a big call, because everything is impressive at TDR)! 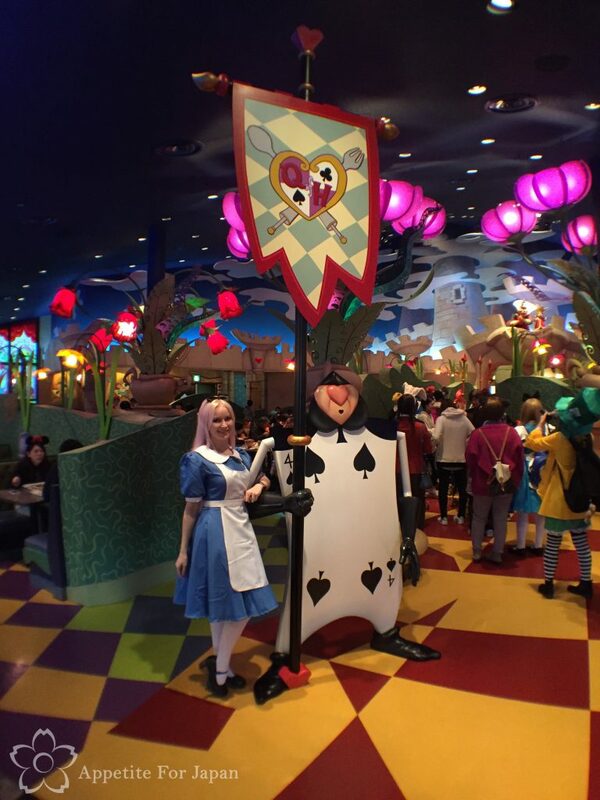 This stint at Tokyo Disneyland was all about Alice in Wonderland for us (read: mostly me), as we were staying in one of Tokyo Disneyland Hotel’s Alice in Wonderland themed rooms, and I was dressing as Alice in Wonderland for Halloween at Tokyo Disneyland. 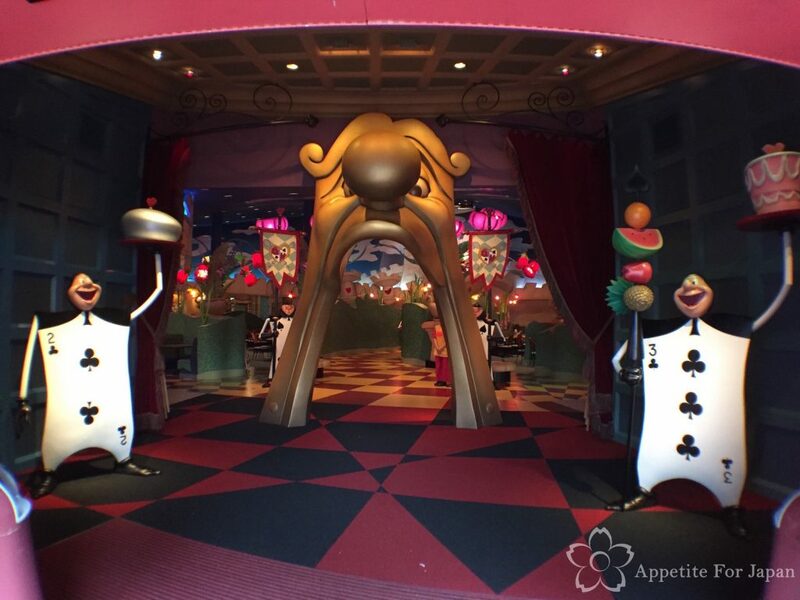 Above: Playing cards guard the entrance and the hallway to the cafeteria area where you can select your food, put it on a tray and pay for it before sitting down and eating. 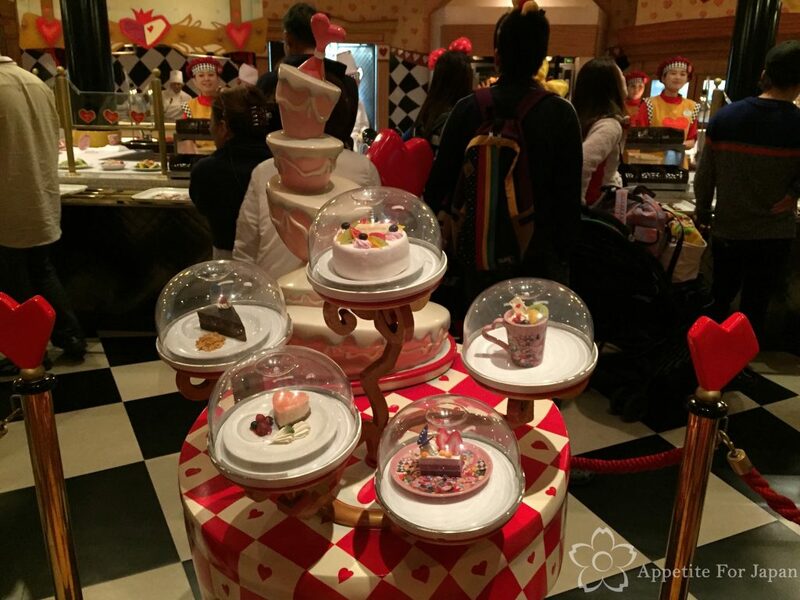 Fake food displays are very common in Japan, and the dessert display fits right in with the Alice in Wonderland theme! 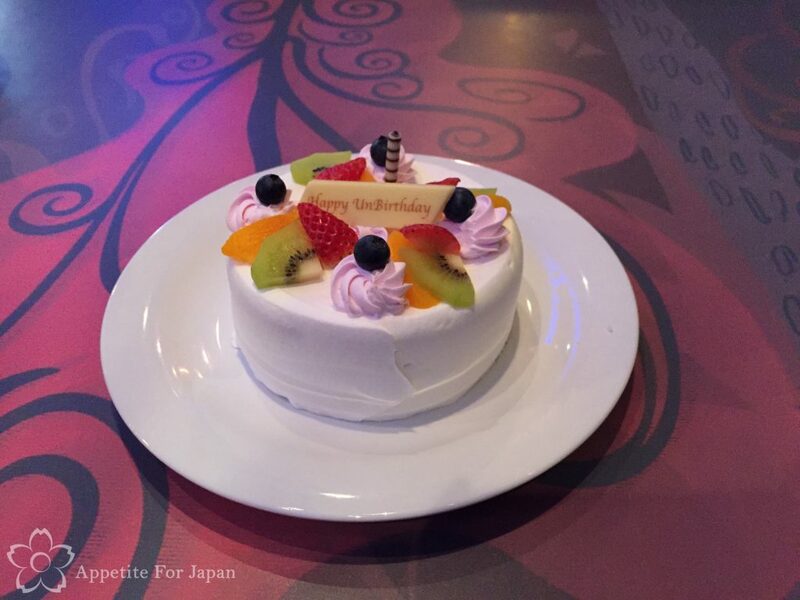 Above: The Happy Unbirthday cake (1,010 Yen) – this is what we ate, and we’ll look at photos of the real thing shortly. 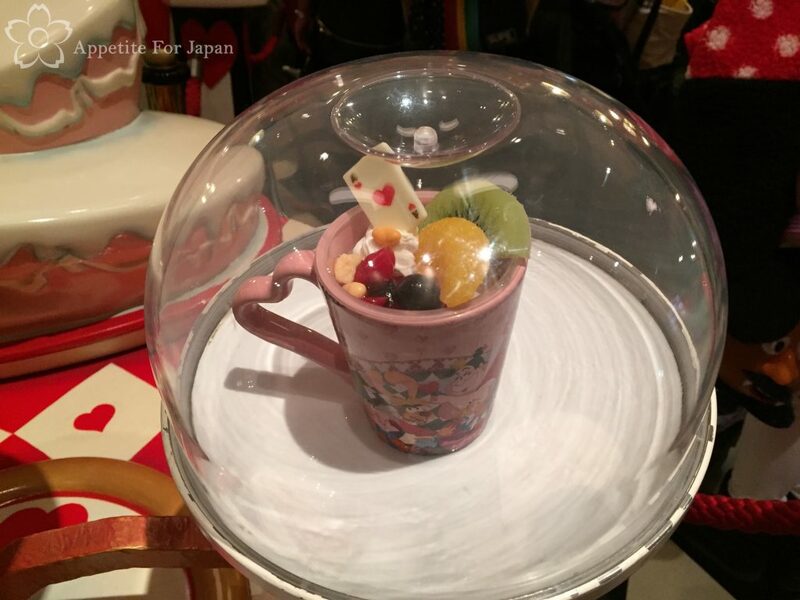 Above: Like many of the eateries at Tokyo Disney Resort, some desserts come in a decorative mug that you can take home. 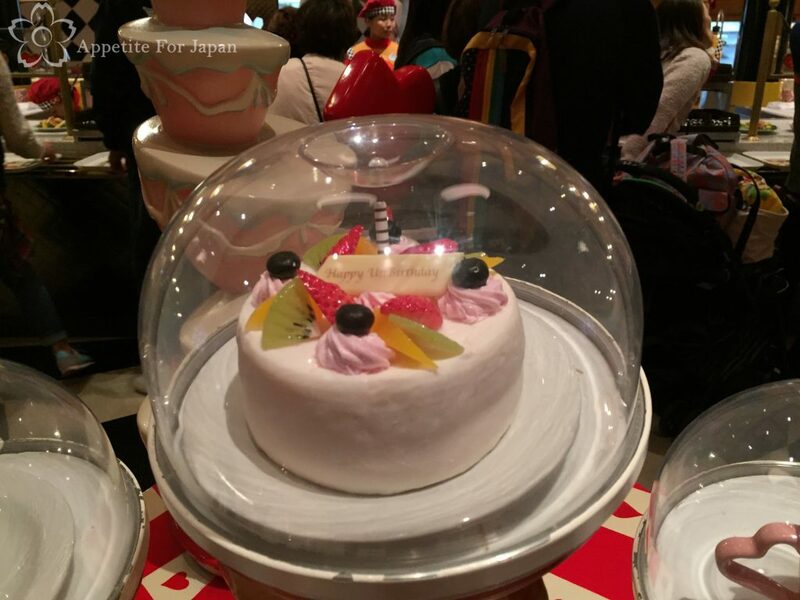 This is a vanilla mousse with fruit on top (750 Yen, including the souvenir cup). Above: Some desserts come with a souvenir plate. 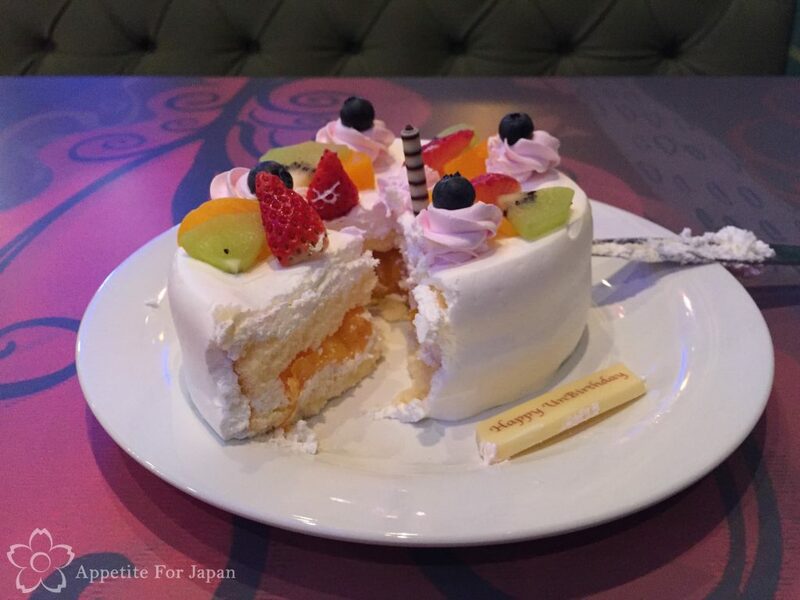 The above cassis cream cake (750 Yen) with the icing butterfly looked great. These days, I tend to avoid souvenir cups and plates because I have enough of these from previous trips, but I was sorely tempted by that cake! 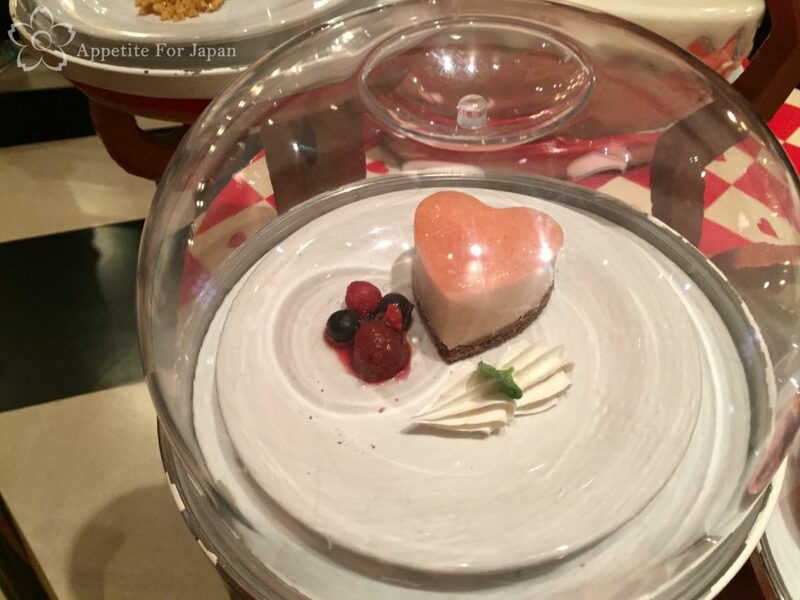 Above: Heart-shaped strawberry mousse cake (430 Yen). 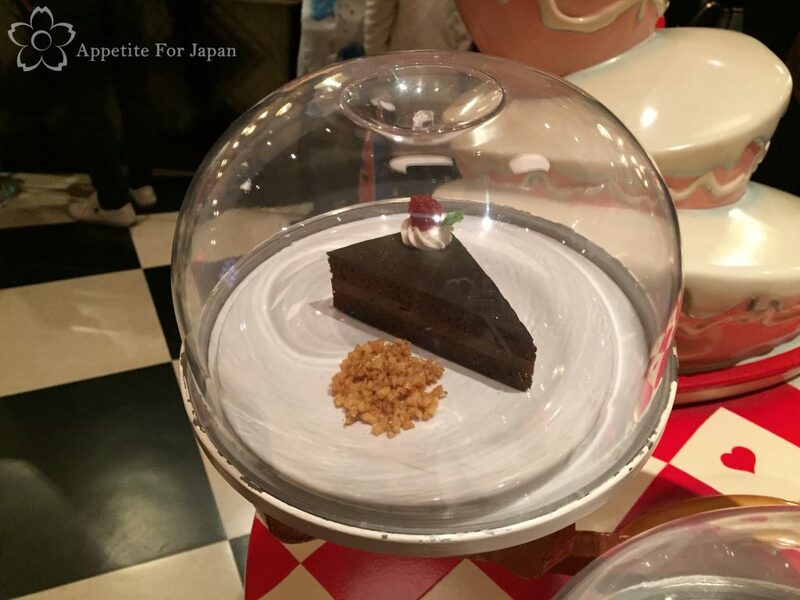 Above: Royal chocolate cake (410 Yen). 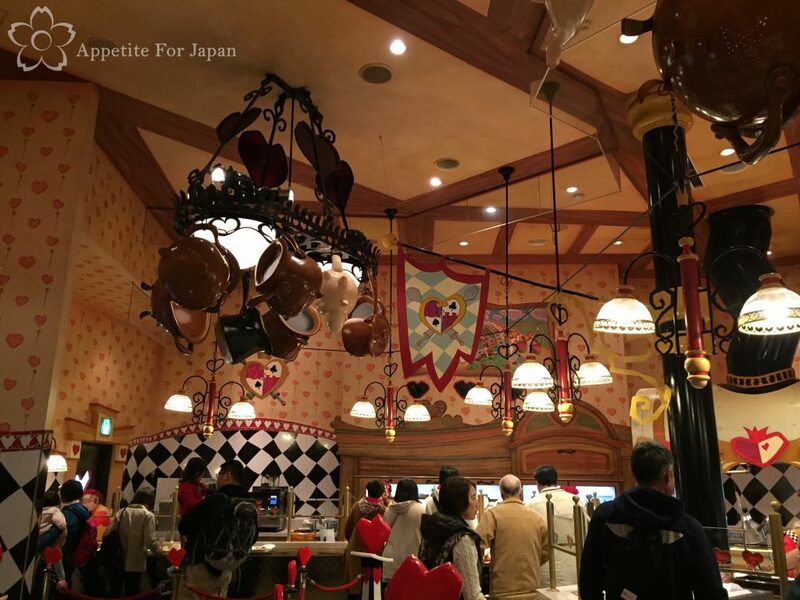 Above: I didn’t take any close-ups of the savoury food, but you can see a glimpse of the meals in this photo, along with the souvenir Mickey Mouse plates. Savoury foods consist of hamburgers (1,380 Yen), steak (which looks more like roast beef with gravy to me – 1,450 Yen), rotisserie chicken (1,380 Yen), grilled swordfish (1,110 Yen), fried seafood (1,210 Yen), as well as a couple of soups (390-410 Yen) and salads (490-960 Yen). 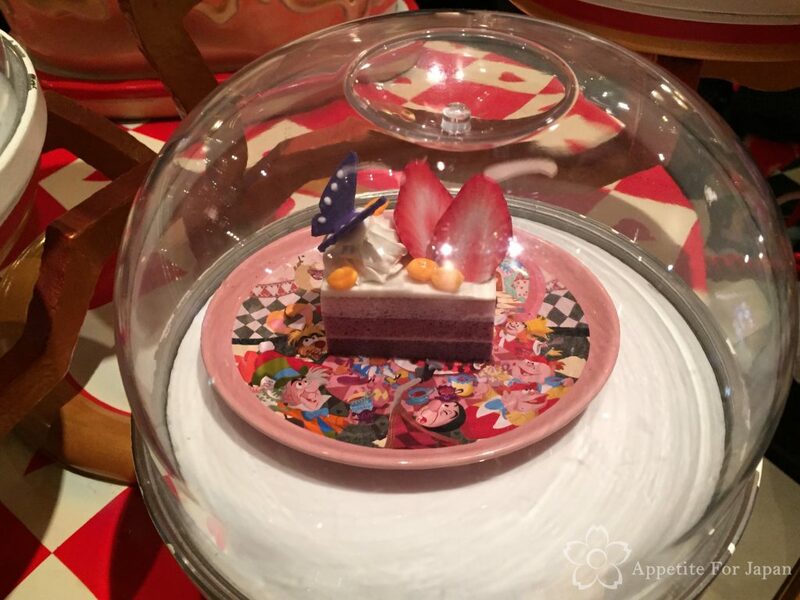 A children’s set – with or without a souvenir Mickey plate – is also available (920-1,920 Yen), along with a low-allergen set (1,020 Yen), and fresh fruit (410 Yen). It looked okay, but we were there for breakfast so we skipped straight to dessert. 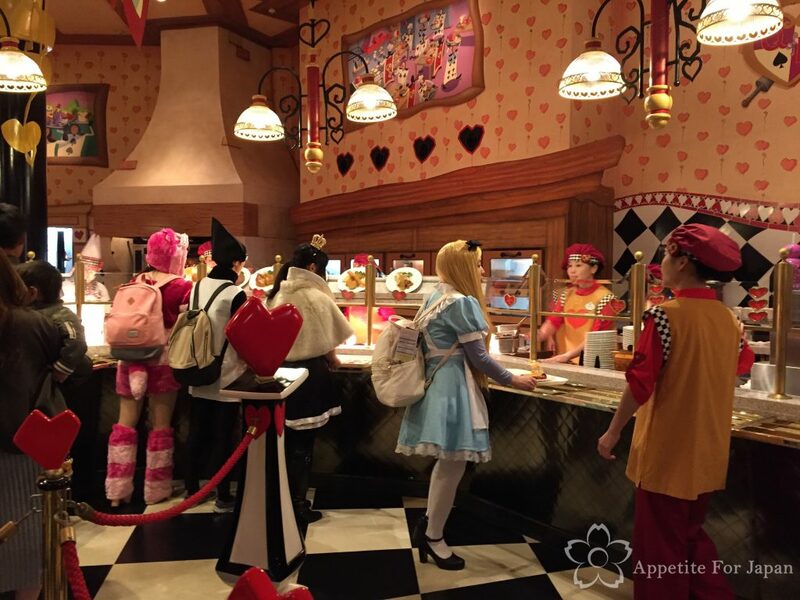 Above: During Halloween at Tokyo Disneyland, Queen of Hearts Banquet Hall is a popular venue for anyone dressed in Alice in Wonderland costumes. These people had the same idea as me! Once you’ve got your food, you can get a table. During busy times, cast members will show you to a table, but if you go when it’s quiet, you’re free to choose your seat. No matter where you sit, the decor is good. 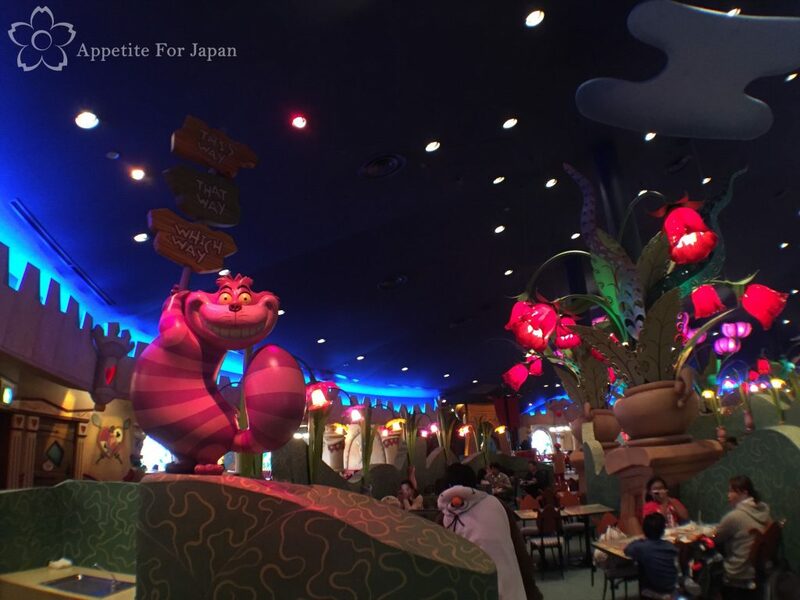 Everything is in keeping with the Alice in Wonderland/Queen of Hearts theme, from the stained glass windows depicting characters or in the shape of big red hearts, to the chess board design on the tables, the rose shaped backs of the chairs, and the giant flower shaped lamps. Once we found a suitable spot to sit, we ate our breakfast – the Happy Unbirthday cake. The cake was fresh, and had tinned fruit and cream in the little, along with some fruit on top. This is the only thing that we tried, because it’s pretty large. Between the two of us, we ate most of it, and we definitely wouldn’t have been able to fit anything else in. 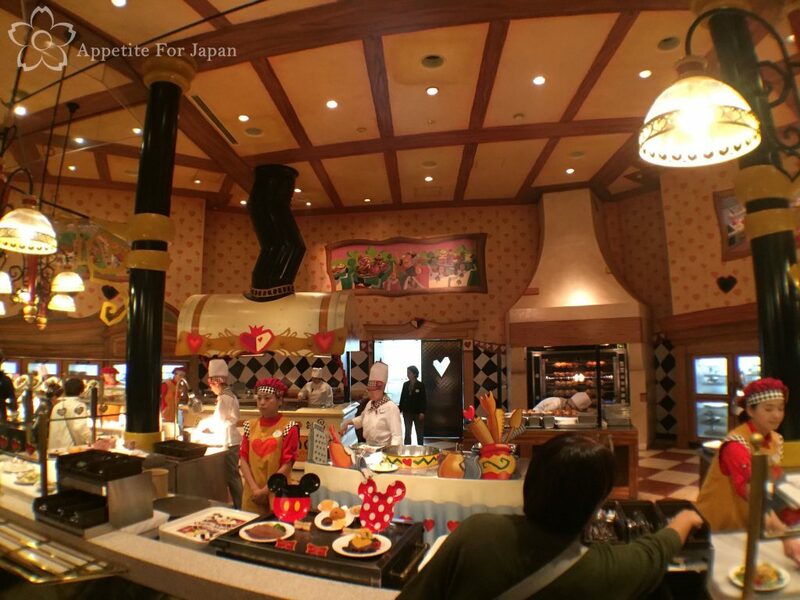 After all, there is so much to eat around Tokyo Disneyland that we like to try to leave room to eat at a few different places. 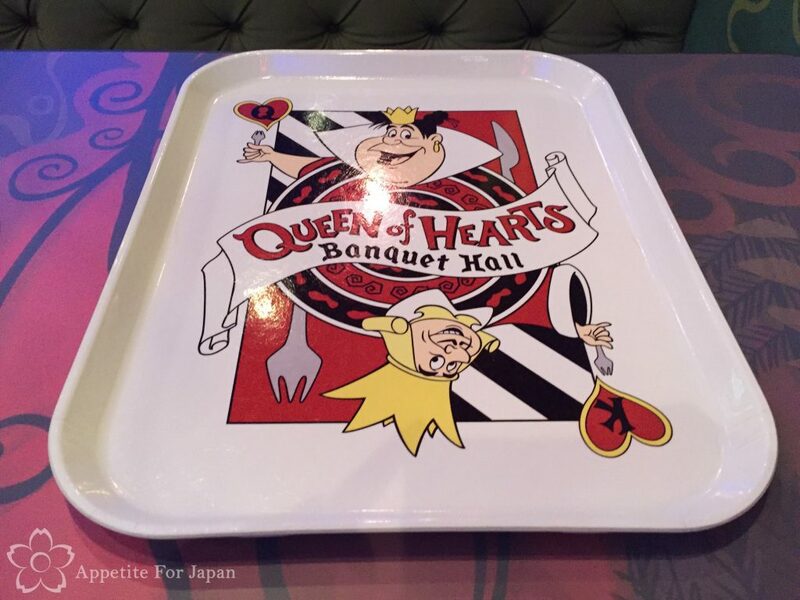 Above: Oh, and even the trays are in keeping with the Queen of Hearts theme. 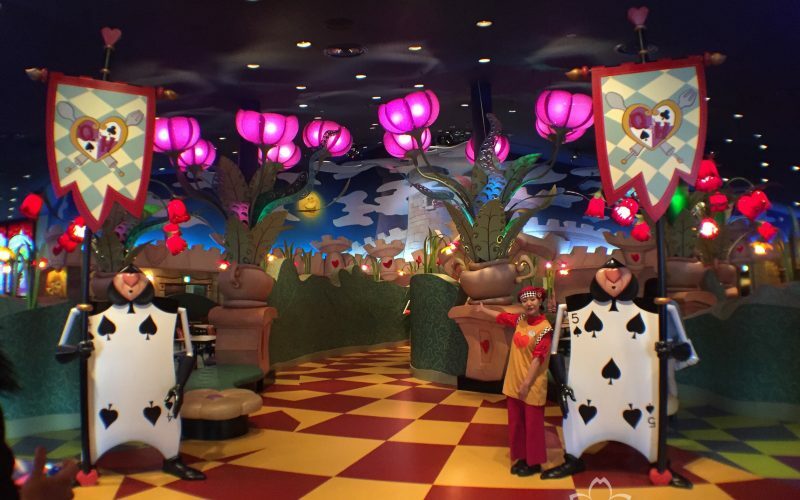 Above: On the way out, I stopped to pose with a playing card soldier, given that Alice in Wonderland was my chosen cosplay for Halloween at Tokyo Disneyland. Note the queue in the background – by the time we’d finished eating, the queue was pretty long. Above: Here’s what the outside of the restaurant looks like. Not a great photo, and the weather didn’t do any favours either (soon after this photo, it started bucketing down). 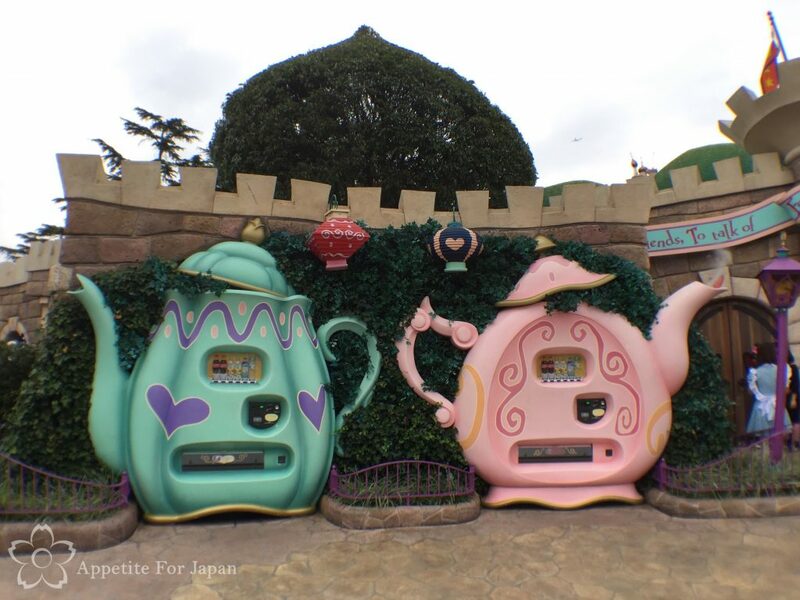 Below: For those wanting a bottled drink rather than lining up for the restaurant, the Tokyo Disneyland’s cutest vending machines are located just outside Queen of Hearts Banquet Halls – shaped like two giant teapots! 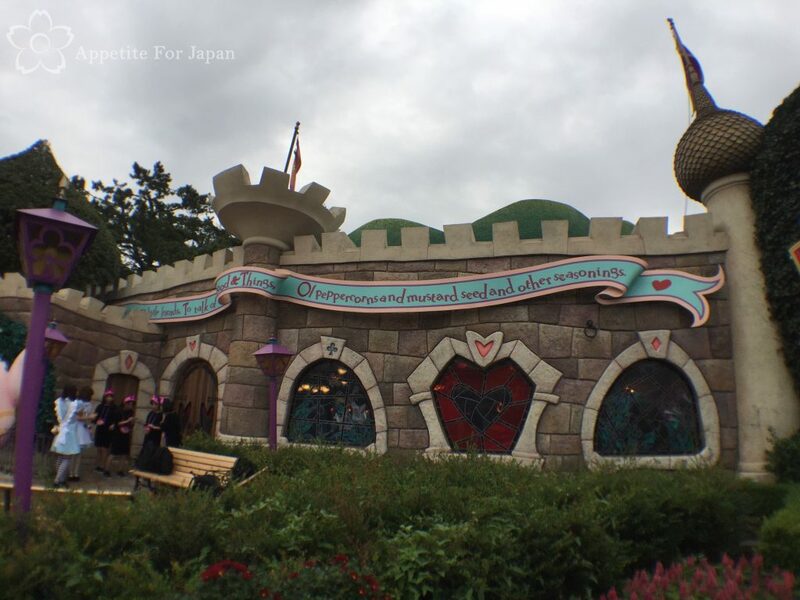 Queen of Hearts Banquet Hall is located in Fantasyland, just near the teacup ride (my favourite! ), the merry-go-round (carousel, for my American readers) and It’s A Small World. It’s just behind Cinderella’s Castle, which you can’t miss. Would I recommend Queen of Hearts Banquet Hall? 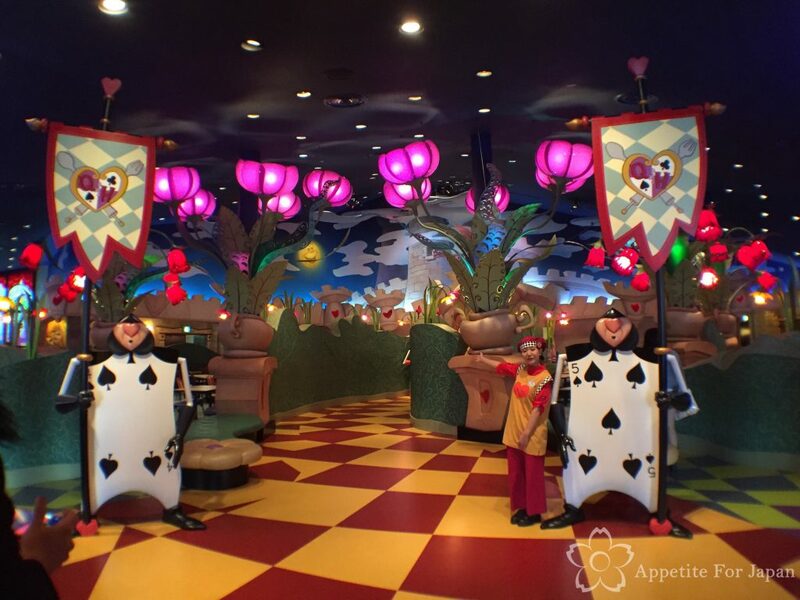 If you’re into Alice in Wonderland and/or themed restaurants with great decor, then yes! I can’t give an opinion on the savoury food, but cake was pretty good. Mostly, I recommend it because the decor is awesome! My top tip is to be strategic about when you visit (i.e., avoiding lunch time! ), if you’re keen to avoid a really long wait in the queue. 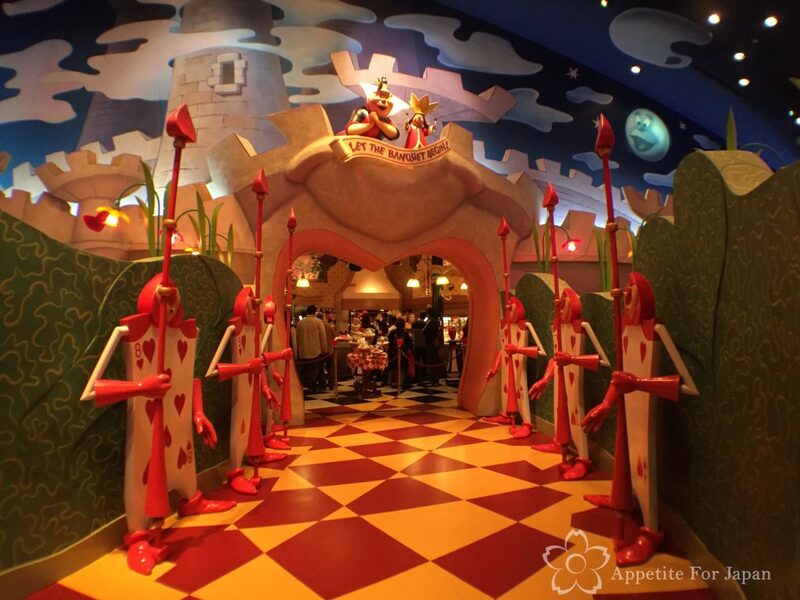 In keeping with the Alice in Wonderland theme, next up we’ll visit another Alice in Wonderland restaurant in Tokyo – this time in Shinjuku. Enter your email address to subscribe to Appetite For Japan and receive notifications of new posts by email. 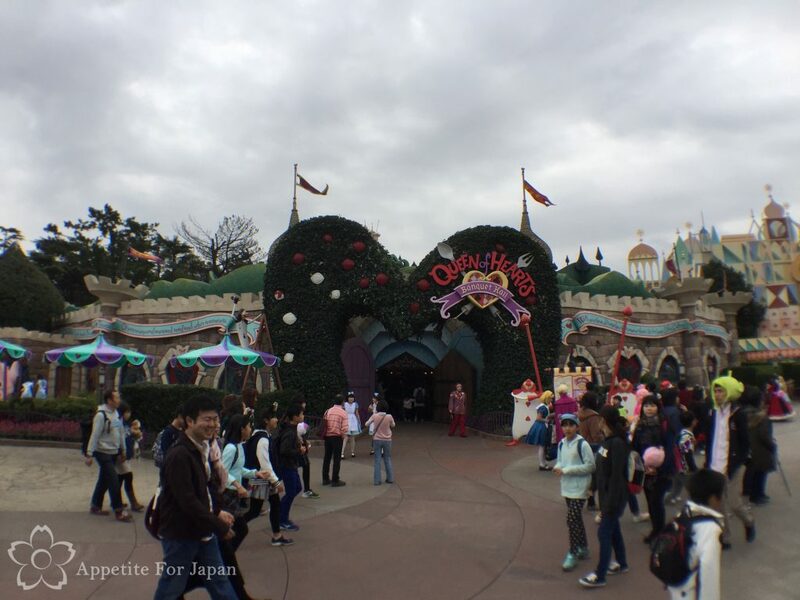 Copyright © 2019 Appetite For Japan. All rights reserved.